Soy-based products are still quite popular, and the majority of them are touted as “health” foods. However, there is a huge difference between fermented and unfermented soy products. People of Asian descent like me tend to eat fermented soy products such as soy sauce, miso and tempeh (I draw the line at natto, which is another fermented soy product with a distinctive texture and flavor which I can’t stand). The fermented forms of soy based foods are safe because the fermentation process destroys the antinutrients which are present in soybeans. In stark contrast, unfermented soy products, including soy milk and tofu, have high concentrations of these antinutrients, including phytates, phytoestrogens, MSG, saponins, trypsin inhibitors, and goitrogens. These substances have multiple deleterious effects on the body, such as impaired absorption of vitamins and minerals, interference with pancreatic and thyroid function, disruption of endocrine function, and damage to the nervous system. For these reasons, I am strongly opposed to the consumption of soy-based products and eliminate them from patient and client diets whenever possible. If you are vegan, or if you are intolerant of whey or casein, look for other forms of protein, such as pea, quinoa, hemp and amaranth, which cause less inflammation when consumed and have a more benign side effect profile. 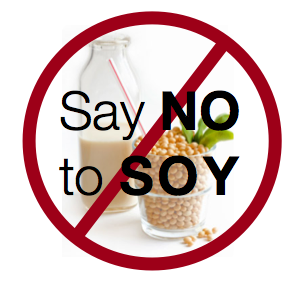 Soy is so ubiquitous that it has become extremely difficult to avoid this substance completely. I am extremely bothered by the fact that there are so many soy-based products on the market, especially since the majority of them are touted as “health” foods. I am half Japanese and grew up eating soy products, but I consumed the fermented forms, such as soy sauce and miso ( I could never stomach natto, which is another fermented soy product). The fermented forms of soy based foods are safe because the fermentation process destroys the antinutrients which are present in soybeans. In stark contrast, unfermented soy products, including soy milk and tofu, have high concentrations of these antinutrients, including phytates, phytoestrogens, MSG, saponins, trypsin inhibitors, and goitrogens. These substances have multiple deleterious effects on the body, such as impaired absorption of vitamins and minerals, interference with pancreatic and thyroid function, disruption of endocrine function, and damage to the nervous system. For these reasons, I am strongly opposed to the consumption of soy-based products and eliminate them from patient and client diets whenever possible. If you are vegan, or if you are intolerant of whey or casein, look for other forms of protein, such as pea, quinoa, hemp and amaranth, which cause less inflammation when consumed and have a more benign side effect profile. One popular alternative protein source, Raw Life Protein (http://www.gardenoflife.com/Products-for-Life/Foundational-Nutrition/RAW-Protein.aspx), contains fermented soy, which does not have negative effects on the body, but if you have a soy allergy, you will not be able to consume this product. Soy has become so ubiquitous in American packaged food products that it can be challenging to find products that are soy free. What I find so misleading and frustrating is that the majority of them are touted as “health” foods. I am half Japanese and grew up eating soy products, but I consumed the fermented forms, such as soy sauce, miso and tempeh ( I could never stomach natto, which is another fermented soy product). The fermented forms of soy based foods are safe because the fermentation process destroys the antinutrients which are present in soybeans. For these reasons, I am strongly opposed to the consumption of soy-based products and eliminate them from patient and client diets whenever possible. If you are vegan, or if you are intolerant of whey or casein, look for other forms of protein, such as pea, quinoa, hemp and amaranth, which cause less inflammation when consumed and have a more benign side effect profile. Make sure to read ingredient labels too, since many products you wouldn’t even think of as having soy often do.